The first person to receive a restricted driver's license for a semi-autonomous vehicle is BraunAbility customer and friend Sam Schmidt. Sam is a retired Indy Racing League driver who has been paralyzed from the neck down since 2000 and, despite his quadriplegia, has become a successful IndyCar team owner. 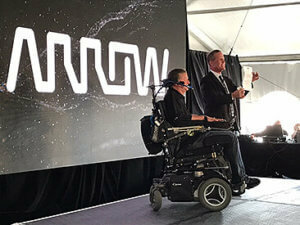 Working with Arrow Electronics, the semi-autonomous motorcar-SAM car-was created; Sam experienced the thrill of reaching 152 mph during testing on his old stomping grounds, the Indianapolis Motor Speedway, using a custom headset and only the movements of his head and mouth to turn and accelerate, respectively. Arrow started to develop the SAM car in 2014. Over the past year, they worked with the Nevada DMV to update their regulations to allow semi-autonomous vehicles to drive on state roads. Wednesday, Sam became the first person in the country to receive a license in accordance with the new regulations. Sam has never been far from racing or advocacy for the disabled community since the accident. Following his recovery from the crash, he cofounded his racing team, Schmidt Peterson Motorsports. He also founded Conquer Paralysis Now, which funds spinal cord injury research; through it, Sam hopes he will not just drive, but walk again. Now, he's going down in history as the first person to receive a license of this kind and to drive in public using Arrow's revolutionary technology. "Getting a driver's license is not the end of the road, but it is the ultimate example to tell the world you can absolutely accomplish anything, if you combine resources with the right group committed to a common cause," Sam said in a press release. "It has truly been a life-changing experience for me and my family." Sam's daughter, Savannah, asked, "What's the first thing you are going to do now that you have a license?" His response, "Take you out on a date."